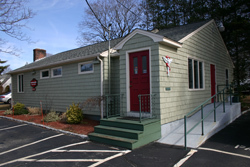 Breiding Chiropractic Clinic, serving East Greenwich, North Kingstown, Providence and Warwick RI, provides alternative health care to the community. Whether you have suffered a personal injury in an automobile accident, while playing sports or at work, our Rhode Island chiropractor, Dr. Mark Breiding uses the gentle practice of chiropractic care to restore your body to health. Dr. Breiding’s approach to chiropractic care is conservative – focusing on the spine and other joints. He uses a variety of tools to help his patients improve their wellbeing including joint subluxation (the “cracking” which helps to realign the joints and spine), massage, ultrasound, and custom orthotics. Many of the doctor’s patients have been with us for years. Dr. Breiding's treatments cover every day health problems such as headaches, migraines, allergies and fatigue. Additionally, he works with patients who require long duration care for conditions like scoliosis, fibromyalgia and arthritis. At Breiding Chiropractic, our goal is to restore your health naturally. Our drug-free and non-invasive treatments use the power of your body to heal itself once it is in a healthy alignment. Dr. Mark Breiding graduated at the top of his class from Life Chiropractic College, one of the nation’s leading chiropractic schools. Since receiving his Doctor of Chiropractic Degree in 1998 and combining that with a degree in Psychology in 1990, Dr. Breiding has dedicated his practice to healing others. His chiropractic and psychology background help his patients relax and benefit from chiropractic treatment. Dr. Breiding will start your treatment by examining you to determine the best natural approach for your healing. If you are searching for pain relief, increased energy or weight loss, our Rhode Island chiropractor has the tools you need to succeed. Once Dr. Breiding has examined you, he develops a personalized approach for your care, as not one treatment method is effective for everyone. Your care plan may include chiropractic adjustments, corrective exercise and nutritional support to ease your discomfort. Your health history is collected so Dr. Breiding can use chiropractic techniques to heal old injuries and prevent future damage. As you begin your healing path with Breiding Chiropractic, Dr. Breiding gently encourages you and motivates you to improve your overall health as well as decrease pain and recover from injuries. Dr. Breiding is happily married with two young daughters and a variety of household pets. (His wife is a veterinarian.) He is an accomplished musician, and still plays soccer – and stays in one piece – largely through chiropractic care. We understand your initial visit to a chiropractor may fill you with apprehension. We also want to assure you that from the moment you walk into our healing center, you are greeted with a smile and put at ease by the gentle and effective ways of our chiropractor and staff. Our health team keeps your information confidential, works with you to obtain correct insurance information and makes scheduling appointments easy and convenient. Our office hours and location will fit into your schedule. We are conveniently located near North Kingstown, East Greenwich, Providence and Warwick RI. We welcome the opportunity to care for you and your family and providing treatments to friends you refer to our practice. Our staff supports you as you heal and we are available before, during and after your appointments to answer your questions. Today is a great day to begin gentle chiropractic treatments that will enhance your overall well-being. If you are ready to begin, please call Breiding Chiropractic today at 401-884-8687.